The episode starts with Talbott talking to himself. He goes to weapons storage, grabs a gun, says he doesn’t want to hurt anyone, and goes to the computer room. Mack finds him but doesn’t realize he’s been compromised. He tells Talbott to get some sleep. 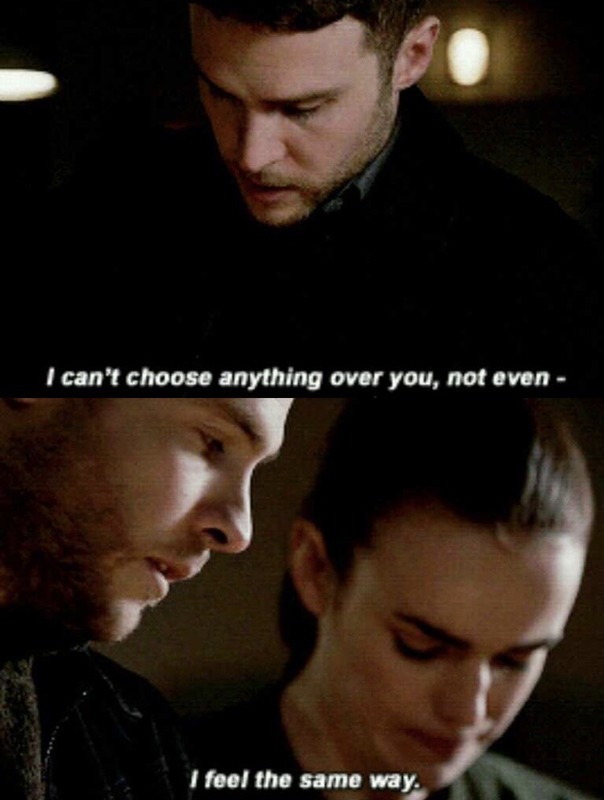 Fitz needs Simmons to complete the machine. Ruby lets her go and help him. Even she ships it. Simmons tries to talk some sense into her, but it doesn’t work. Von Strucker comes in and tells Ruby that he found what’s left of the Superior and sent the bots after whoever killed him. He shows her the gravitonium, which a redshirt has just brought in. Fitzsimmons talk about what to do. They decide to stall. Yo-Yo gets to the Quinjet. There is no signal to call for help, so she collapses. Coulson tries to finish THAT conversation with May, but she’s task oriented. Daisy found Hale’s base. She won’t let Coulson come. Mack and Deke are also going to stay behind. It’s honestly hysterical to watch Deke try to back Daisy up when all he does is annoy her. Especially considering how done Mack is with the whole thing. Coulson and Daisy talk before she leaves. She thinks he's too easy on her. He’s thankful she rescued him. Hale is rescued and finds out that the Superior is dead. She’s worried about Ruby, a feeling that is further solidified when she checks on Creel. He’s much worse. Hall and Quinn want out, and he’s prepared to crash through walls. Mack is working on making the Zephyr space proof, just in case. Deke and Coulson walk in, and they all have a lovely chat about what Deke said when he was high. They are hilariously little help: Yo-Yo locked Mack up and left him, and Coulson cannot finish his conversation with May. Deke wants to follow a tradition that they had in the Lighthouse: leaving lemons on beds. Mack and Coulson tell him to do it. As I said, no help. Talbott is in Robin’s room, looking at her drawings. He sees the Zephyr going into space and references the Red Room. Daisy tries to talk to May. May wants to hit something. They drop in the inhuman container with a missile into Hale’s base. They attack, and May gets to express her feelings. When they run into Hale, she surrenders. She wants their help to stop Ruby. Fitzsimmons have reversed the infuser and have to start again. Ruby beats up Fitz and threatens Simmons and I really hate her. Yo-Yo wakes up to a bot entering the Quinjet. She Yo-Yo’s it and takes its gun, but she’s now in more pain. Robin’s mom catches Talbott, and he makes up a story about his son. Robin knows him because she’s drawn him. Daisy tells the boys about Creel and Ruby. They’re all worried about her, but she is a big girl and can take care of herself. She wants them to go through Robin’s drawings. Talbott attacks Robin’s mom, and Robin stands there motionless. Once her mom is unconscious, she goes with Talbott. Sometimes that little girl gives me chills. The Zephyr lands at the facility. Daisy and Hale talk before they and May go in. Von Strucker tells Ruby about the plane. She’s about to hurt Fitzsimmons when they say they’re finished. They make a last-ditch effort to talk some sense into her. They also don’t know how to get the gravitonium into the machine. It goes in without a problem, something that Fitzsimmons recognize as a bad sign. Deke has lemons. Coulson and Mack realize something is wrong near Robin’s room. They find her mom alive, and Mack tells them about his run-in with Talbott earlier. 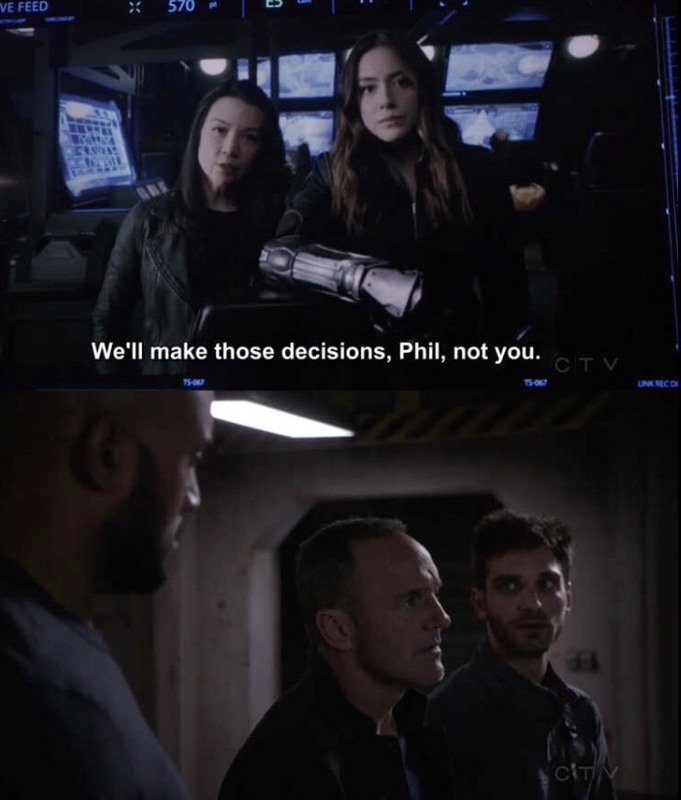 Coulson beats himself up that he didn’t think of that sooner. Von Strucker and Ruby kiss and he closes the chamber. Once he starts the reaction, she begins to scream. Daisy, May, and Hale hear it and get there in time to pause the infusion at 8%. Ruby floats out of the chamber and crashes to the ground. She has Hall and Quinn in her head, and when Von Strucker tries to comfort her, she accidentally squishes his head like a grape. There’s no question of his being dead now. She wants the gravitonium out of her, but they don’t know how to do it. Didn’t they have the infuser reversed before? Wouldn’t that work? Anyway, she doesn’t like that answer and pins Fitzsimmons to a wall until Hale can talk her down. May gets Fitzsimmons out. Mack and Coulson find Talbott and Robin. Coulson tries to talk him down. He lets Robin go, but now has the gun pointed at himself. Hale and Daisy try to talk to Ruby. 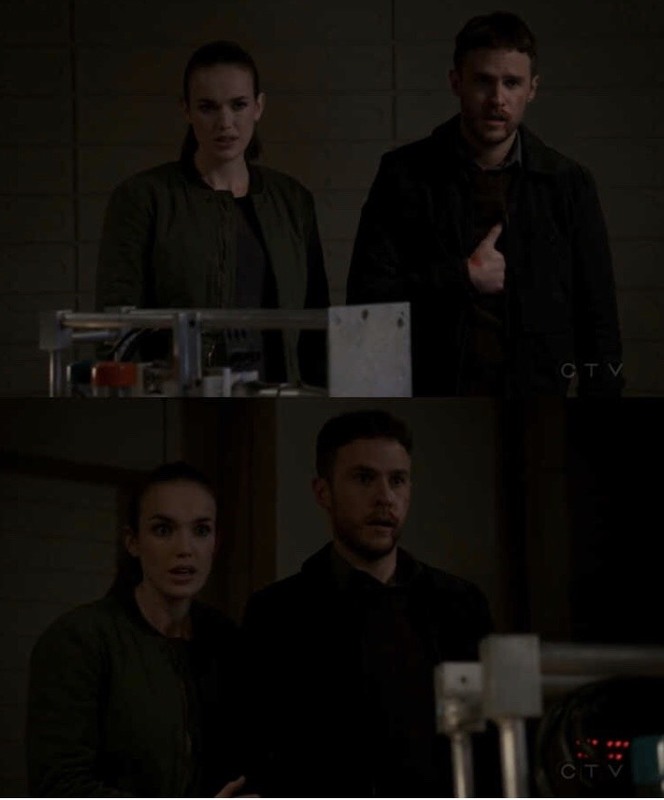 May and Fitzsimmons run into Yo-Yo, who now knows that Daisy is there, and she charges into the room. Robin goes to Mack, and he leaves. 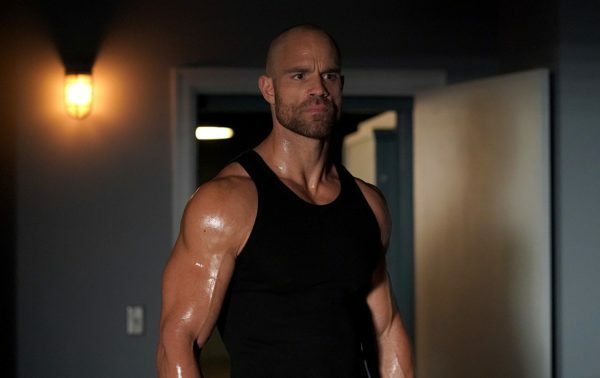 Coulson tells Talbott to turn the gun on him, and then Mack ices him. I’m so grateful for Mack sometimes (all the time). Ruby starts to choke Daisy until Hale makes her stop. Hale apologizes about everything and they have a really nice moment, until Yo-Yo ruins it. She uses Ruby’s weapon to slit her throat. 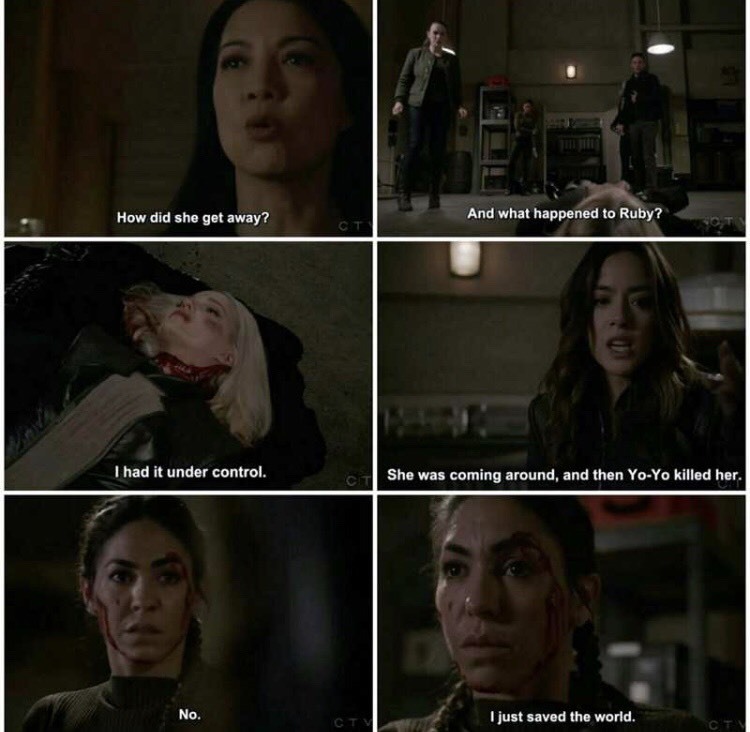 Daisy is mad because she thinks that Ruby was coming around, plus she promised Hale she wouldn’t hurt Ruby, but Yo-Yo is convinced she saved the world. Considering the explosion that erupted from Ruby’s body as she floated in the air and the fact that Hale is nowhere to be found, she might have just doomed it. Considering the explosion that erupted from Ruby’s body as she floated in the air and the fact that Hale is nowhere to be found, she might have just doomed it. And now for the dun dun dun. Hale is in the Confederacy room and tells her contact that S.H.I.E.L.D has the gravitonium and she doesn’t care if he kills all of them. This is bad. This is very very bad. Yo-Yo is now at the top of the list of people who need to get their head screwed on straight. Never anger a momma bear like that. Especially this one. 8/10.